The Gutter Man of Tampa Bay is a local gutter cleaning and gutter repair service in the Tampa Bay area serving home and property owners in Clearwater, Tampa and St. Petersburg. The Gutter Man started in 1998 as a gutter cleaning business focused on excellent service rather than cheapest price. Since then, our business has continued to grow and expand despite a flailing economy. Why? It’s simple. Over 90% of our current customers are referrals and repeat business — meaning that the people who choose The Gutter Man not only choose us again, they tell their friends to use us as well. That’s something that speaks for itself. Since 1998, we’ve expanded our services to keep up with demand. We can currently handle everything from gutter cleaning, installation and repair to soffit and fascia work — and more. But you don’t have to take our word for it. 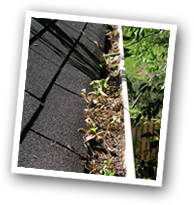 We’re willing to earn your business by giving you a FREE Gutter Inspection & Estimate upfront — no risk or obligation! Call now to meet The Gutter Man by claiming your FREE Gutter Inspection & Estimate! Gutter Man was always reachable and was flexible to our schedule. Honest and upfront. This adjustment was far less expensive than replacing the gutter. This approach gained my loyalty immediately. I will call this [The Gutter Man of Tampa Bay] to routinely clean my gutters and will definitely contact them for future repair and/or replacement. Arrived on time to give an estimate. Scheduled to my availability. Work was fast, as promised and clean-up complete. Costs were exactly as estimated.